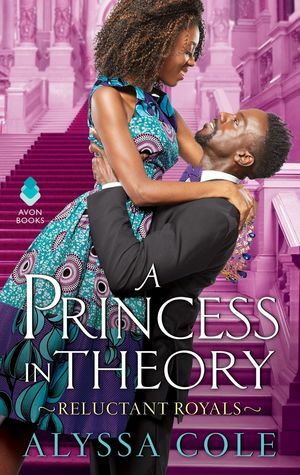 A Princess in Theory is book 1 in the Reluctant Royals series. I was so glad to see my library got this audiobook in stock and grabbed it as fast as I could. I'm seeing more diverse reads popping up lately and it makes me so happy. I'm going to try to read as many as I can this year. Our leading lady, Naledi Smith is working her way through grad school and juggling part time jobs to stay afloat. As a girl that grew up in foster care, she knows she has to rely on herself and works herself to the bone. What she doesn't have time for is getting spam emails saying she's betrothed to an African prince. Enter Prince Thabiso, heir to the throne of Thesolo, he's there for business but wants to meet Naledi and see why her family whisked her to the USA and she stayed away. He happens to be at the right place at the right time and impersonates the new hire at one of her part time jobs. He does this to learn the real reason on why she disappeared from Thesolo and though there are many missteps like saying the wrong thing or lighting something on fire they wind up kind of trusting one another and liking each other. While their relationship is blossoming, I was just waiting for the shoe to drop when Naledi finds out Jamal isn't his real name and he's been deceiving her. A Princess in Theory reminded me of a fairy tale and was a really enjoyable read. Naledi is a strong character but really doesn't want to rely on others because of her past. I felt for her, she's been through so much. The pacing was a bit off for my taste since it wraps up a bit quickly. We kind of hurriedly towards the last forth of the book watch them go to Thesolo when I think it would have been better if we saw it around the halfway point. That being said the book was really good and I can't wait to see what happens in the next installment, it will be focused on Naledi's BFF, Portia. If you're a fan of royalty contemporary romances I think you'd enjoy this novel.